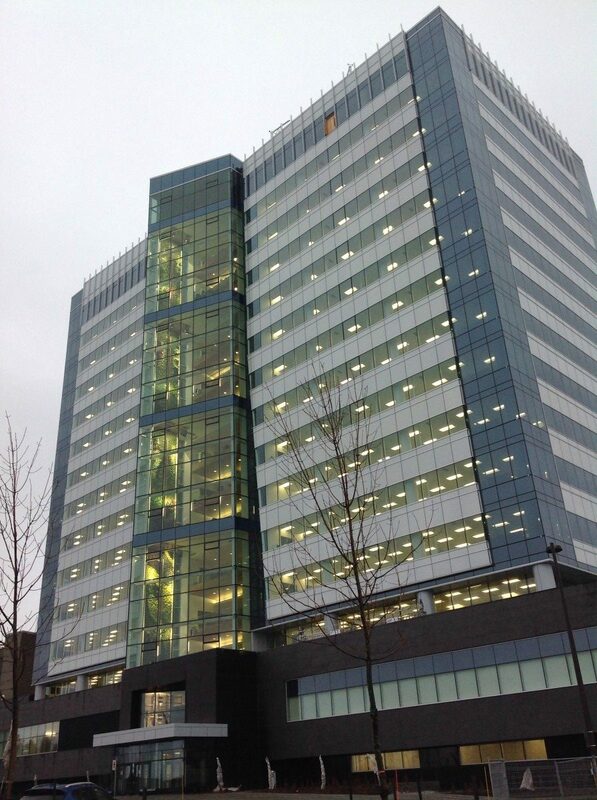 • There are more than 11,000 individual plants artfully arranged according to colour, texture, pattern and size covering a 16-storey wall of the new building at Desjardins (Bank) Headquarters, in Lévis, Quebec, Canada. • Plants are growing in a hydroponic system (i.e. soil free) made of 100% recycled materials. • Green over Grey eco friendly panels are built from 1.5 metric tons of recycled water bottles and plastic bags. 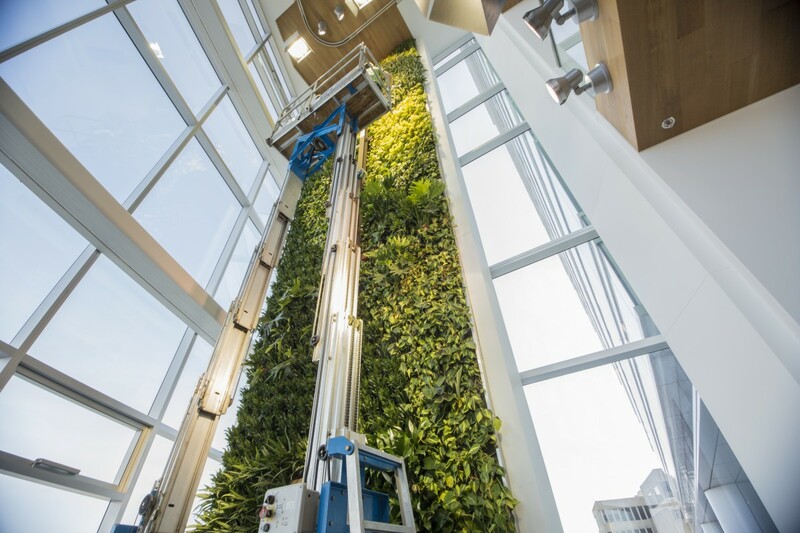 • The living wall is 213 feet high (65 meters) with a total surface area of 2,139 square feet (198 square metres). • 42 plant species, including philodendrons, anthuriums, monsteras, fig trees, ginger, snake plants, stag ferns (Platycerium bifurcatum), scheffleras, clusias and banana plants. 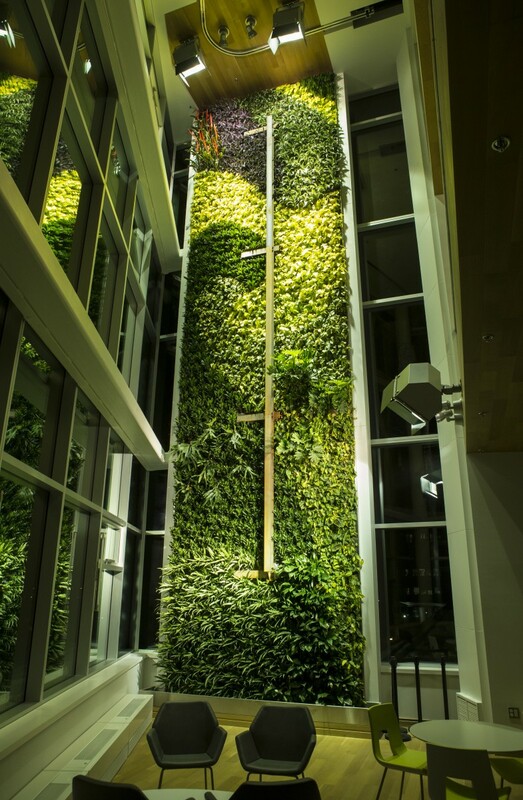 • Plants are laid out to evoke the beauty of the St. Lawrence River as seen from the Quebec and Lévis areas • The living wall is situated on the north side of the new building, which provides office space for roughly 1,450 employees. • The artwork can be seen from the opposite side of the St. Lawrence coast, specifically from the high-traffic Dufferin walkway in Old Quebec. • The shear height of this wall created the largest obstacle to overcome. A special lift was engineered to access all points of the wall. The red (purposely made to rust for aesthetics) bar in the centre of the wall is used for the lift to be guided up.